Tomorrow night I leave for El Salvador for my spring break adventure. I am a little nervous about this, since I’ve never gone on such a trip before, but I’m also looking forward to it. There will be four faculty members and fifteen students making the journey. A delegation goes every year at spring break, and the students who have gone before have passionately explained how it is a life-changing experience. One of the things that makes me happily anticipate the trip is the enthusiasm and joy that the students are expressing. One girl going said that she made the decision to take the trip because she will turn 21 during spring break. At first I thought that sounded like a rather strange thing, since El Salvador is not really a typical college spring break party destination. But she explained that she wanted to do something different and memorable for her birthday, something where she could come away with a meaningful experience. Most of the students have similarly earnest desires. One guy is going partly because of his father, who visited the country during the civil war of the 1980s. His father, a peace activist and social justice theologian, runs a peace center in Massachusetts. Another girl wants to be an English teacher (so I’ll be her prof next year when she’s a sophomore) and work in underprivileged areas. She has dreams of maybe teaching through the Peace Corps or Americorps. In short, it is a good group of kids who exemplify the best of their age and tear down the stereotypical image of the drunken, solipsistic college student. I don’t know if I could express my reasons for going that clearly. Part of it is a desire to have some sort of adventure that I did not have while I was in college. Part of it is the idea that I should never, ever turn down the chance to see and do new things, even if doing these new things makes me feel nervous or anxious. Part of it is the shameful knowledge that I, a comfortable middle-class American, do not come anywhere close to giving back to the global society the things I owe it. Whatever my ideas are now, I am sure that the week I spend in a dusty little Salvadoran town will help clarify things for me. I’ll have a lot to say, I imagine, when I get back, and I’ll probably post a picture or two as well. In the meantime, adios. 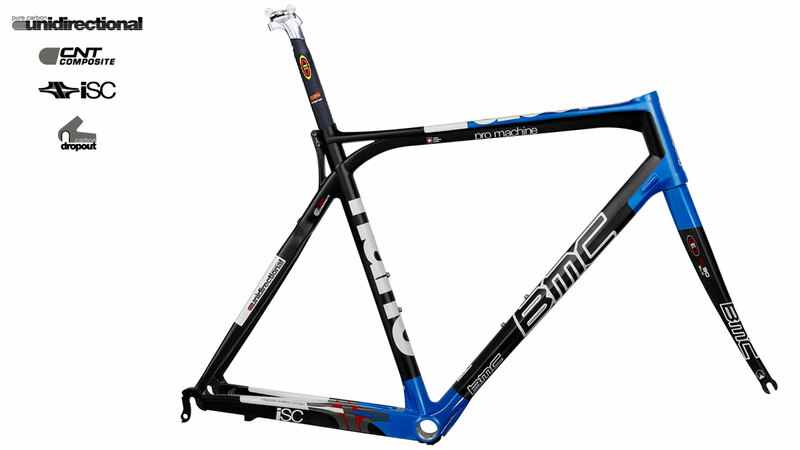 I’ll get straight to the point: I would like you to send me a 2008 BMC Pro Machine (blue) built up with Campagnolo Record components. I understand that this request, coming from a 40 year old college English professor probably makes little sense. It may come across as outrageously presumptuous, or even recklessly arrogant. Let me explain, though, and I’m sure you will see the wisdom and, more importantly, the marketing value of such a move. I first saw a BMC bike in VeloNews when Tyler Hamilton left CSC to ride for Phonak. I instantly felt a heartsick longing for that aluminum lugged carbon frame, the SLT Team Machine. The frame was incredibly beautiful in that purposefully engineered, industrial sublime manner. The feelings it evoked reminded me of my first view of the Porsche 959 prototype when I was in high school. Both machines exemplified the thrilling promise of serious-minded technology coupled with adrenaline-drunk exhilaration. I knew that the Porsche was an unattainable dream, and, for a time, the BMC felt that way as well. Although I never realized my dream to own, or even drive, a 959, the next time I was in the market for a bike, I knew without equivocation that I wanted that BMC. My trusty Team Machine has served me well. It is an awesome bike in every way. I am a large, strong rider, yet I cannot make the bottom bracket flex. It rides beautifully, and I can enter a race knowing that my showing will not be compromised by my equipment. However, the sight of that new Pro Machine in blue, the color of my first ten speed, makes my heart ache with longing. I recall the feeling of the wind in my nine-year-old hair on Christmas morning when I pedaled off on that blue Centurion, and the sparkling blue of the Pro Machine takes me back to that moment. But I still hear you wondering, “Why should we give this guy a bike?” Three words: Tyler. Floyd. Vino. Your company got burned three times by three different riders. Your sponsorship dollars seemed to call down a curse of French testing labs. People on bike discussion forums were making jokes about how every BMC bike came complete with a vial of EPO. Here is the solution: I ride clean. The strongest thing I take before a race is Advil. Sometimes I’ll smear some Ben Gay on my legs. I will never embarrass you with a bad B sample. Plus, I can write. Tyler, Floyd, and Vino could not even hope to come close to me in the sprint to the dramatic metaphor. And the mountain of gorgeous prose? Forget those guys with their weak grasp of grammar and hackneyed sports cliches. I ride and I write. I would write pages about the wonders of the Pro Machine. But there’s more. Every single time I go to a local New England race (and I go to several dozen every year), I get stopped by someone who wants to talk to me about my BMC. I sing its praises and smile at the naked longing on their faces. Imagine how that response would increase exponentially if I were riding that blue Pro Machine instead of my gray Team Machine. There would be no better advertisement. Consider my offer carefully. I may not have the notoriety of Floyd or the boy-next-door charm of Tyler or the fierce stare of Vino, but I am a real rider who can truly appreciate the importance of a fine machine. If you decide to go with this, we can discuss the size and specific component selection over e-mail. Thank you for your time. I look forward to riding my new bike very soon. The past couple of weeks have been more than usually stressful. Last fall, the university president’s office decided to co-sponsor with the faculty governance council an intense retreat to discuss our school’s retention issues, and I volunteered to serve on the planning committee. It’s an issue that interests me, and, politically, it’s a good committee to be on. Then I was invited to join the annual spring break service trip to El Salvador, which begins at the same time as the big retreat. I decided that I could do both and got special dispensation from the president’s office to cut my time at the retreat short so I could go on the trip. This is the big week: the retreat begins Thursday, and our flight leaves JFK at 3:30 Friday morning. As anyone might guess, I am more than a little nervous. Then, last night I went into the basement to get something for the trip, and I discovered water trickling out of our water heater. Just what I needed–very expensive plumbing nightmares on top of everything else. I only slept three hours last night out of worry. Faithful readers will remember my mention of Apu, my Stanley Tucci fan cycling friend. He’s a contractor, and when I called him for advice, he put me in touch with a good plumber. Today the plumber dropped by to check out the ailing water heater. Instead of needing a new water heater, we simply need to replace a corroded pressure relief valve. Instead of $1000 for parts and labor, we will only need to pay $85. I’m hoping my good clean living has finally begun to reward me with some karmic points. I have always been fascinated by our fascination with telling stories. We all like to hear them, and many of us also like to tell them. In one of my classes, I am teaching The Odyssey, and I point out to my students all of the times Homer makes explicit references to the importance of storytelling. On Phaeacia, Odysseus encounters the blind bard Demodocus, who tells the story of Troy and the heroic actions of a certain Ithacan named Odysseus. Later, Odysseus himself takes center stage as he regales his hosts with all of the gory details of his many adventures from Troy until his shipwreck and discovery by Nausicaa. As he tells the story, he stops a couple of times. The first time, the Alcinous insists that Odysseus must finish telling the story soon, and the second time, the audiences sits in hushed awe as they think about the wonderful narrative their unexpected guest has finished. Homer’s example is not the only one, of course. In another work I am teaching, I again ask my students to consider the power of storytelling as they see what happens when Scheherazade teases Shahryar by slowly telling him only one story a night, using the king’s undeniable compulsion to hear more to prolong her life. Scheherazade knew that stories are addictive, and I also understand their power. I was one of those boys who stole hours of sleep by reading under the covers with a flashlight, and my inability to shut the book led me to wonder what made stories so addictive. This morning I heard a story on NPR that might help explain, or at least helps me to form a new theory about the magnetic power of stories. I have provided a link to the story, so I won’t explain it in great detail, but the quick version is that researchers have figured out that families that have dinner together and have real conversations and stories at that meal produce smarter children with better vocabularies and reading scores. So this made me wonder if there is an evolutionary reason for our attraction to stories. To go back to Homer for a moment, Odysseus listens to stories and tells his own at big feasts, and other narratives that emphasize the importance of stories follow similar paths. The stories reinforce cultural values while teaching thinking skills and social interaction. The communal meal that sets the stage for the story fulfills the same purpose by forging social and cultural connections. Any society that values storytelling and communal meals will strengthen social bonds and pass the cultural material down very effectively while also building the intellectual power of the children and increasing their critical thinking skills. These strengthened cultural bonds would then help that culture remain strong enough to survive and pass the cultural DNA on. In other words, there is an evolutionary advantage to storytelling. So when someone criticizes us for spending too much time reading, we are really doing what evolutionary biology tells us to do. I like it–it’s a theory that makes sense to me.